Williams Lake, B.C. – Effective immediately, the Cariboo Regional District has issued an expanded evacuation alert for the area south and west of Quesnel to Tatelkuz Lake. 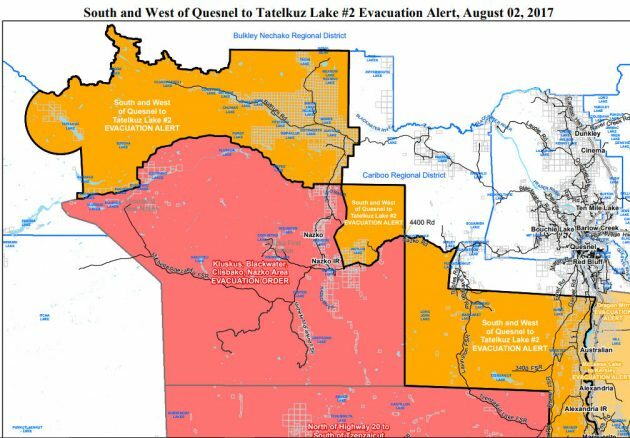 This alert expands the evacuation alert for the south and west of Quesnel to Tatelkuz Lake area issued on August 1, 2017 and the evacuation alert for the area south of Quesnel and west of the Fraser River issued on July 28, 2017. This alert is being issued due to the Tautri Complex wildfire (C50784) and the wildfire 4 kilometres north of Baezaeko River (C10812). See a map of the area below. Keeping essential items readily available for a quick departure; including medications, eyeglasses, valuable papers (i.e. insurance), immediate care needs for dependents and, if you choose, keepsakes (photographs, etc.). Further information will be issued as it becomes available via the CRD Emergency Operations Facebook page (@CRDEmergencyOperations) and the CRD website www.cariboord.ca. For more information contact the CRD’s public phone line at 1-866-759-4577. I may be mistaken but is this fire spreading North by northeast?